Curious eyes followed the young speakers on stage, as they unpacked their stories of success in the areas of tech during BarCamp Prishtina Kids Edition #2. The event was set up underneath a cozy tent at the Zahir Pajaziti Square in Prishtina. 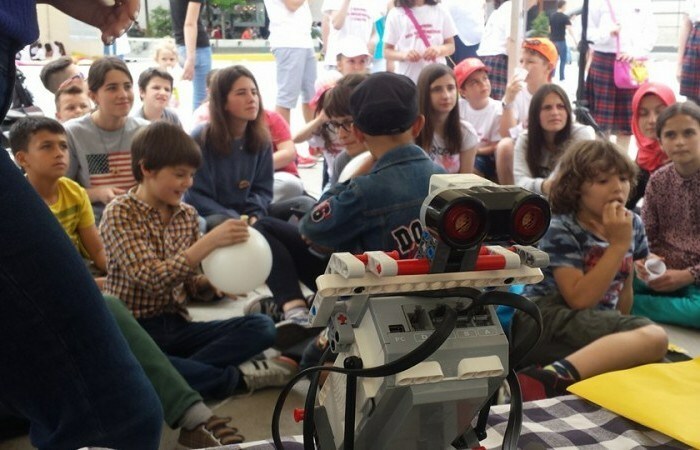 The event was held in honor of the International Children’s Day on the 1st of June, starting from 13:00 and attracting an excited and energetic young audience! The presenting table was covered by laptops, robots, and game setups that not only looked interesting and inviting, but displayed a great deal of skill from the youth involved in the making of them. With the aim of presenting their experience in a theoretical and practical way, speakers were invited to share their stories with the young audience and to inspire them to follow their dreams and passions in the tech field. Bardh Zajmi shared his experience as a third place winner of Design Challenge which took place weeks ago. He was part of the team that built a LEGO robot, and programmed it to perform a specific task, propelling his team to the third place during the Design Challenge competition. “LEGOs are creative, and it was very interesting to see how our robot ended up looking and working. Not everything resulted in the way we planned, but we loved our robot and it got the third place,” said Bardh during his speech, encouraging tech supporters to pursue their love for engineering. Loran Pllana together with his colleague Dren Shala, took the stage while explaining about their work. Loran is a young soccer and tech lover and part of the JCoders academy. He combined his love for technology and soccer into one simple but very fun game, where two soccer players could hit the the soccer ball towards the opposing team with the aim to score a goal. Dren had a different kind of system to present before his curious audience. He came up with a color memorizing system, the levels of which could be raised to harder difficulty according to the players wishes. He used a circuit board and system on simple pieces of paper, that operated with touch pressure sending signals to the computer where the game was being controlled. Bleart Këpuska, member of the BONEVET academy, shared his story of applying to the most influential Albanian TIK Event – ICT Award. During his speech, he shared the story of how he became one of the winners in the event, winning the prize of “Rising Star” during the TIK – ICT event he was part of. Bleart closed his speech, and welcomed questions, with many of the youngsters wanting to know about the tools and sources they used to create the things they had brought to the table that day. The speakers inspired their audience to follow their passion for technology, closing the event with a practical show and tell of their work.